Is this an Ornamental Peach or Cherry Blossom? It sure looks like a Japanese Cherry Blossom with the single layer of petals, but the neighbor who gave it to us swears it's a peach tree. Which is it? Without seeing the leaves it's difficult to identify any kind of plant from just the flower. So many of those in the same genus look very similar. 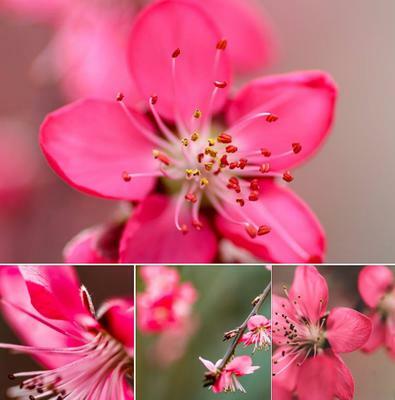 This does indeed look like a peach blossom, which as you may or may not know is in the same genus (Prunus) as cherry and apricot, as well as almond and others. So no surprise that they all have similar characteristics. Double flowers are a more recent development, and as a rule, are non fertile. This means that they're used more as decorative or ornamental trees. To get fruit, stay with the single flowers. This tree must be a lovely sight in full bloom! With luck and a steady mild spring with no frosts you may get some peaches if you're in a place that has long seasons so they have time to ripen. They need to be insect pollinated, which means bees have to be active and looking for the pollen. Unlike some other types of fruit (apples, oranges and others) peaches have to ripen on the tree, they stop ripening after they're picked. Even if you don't get any fruit, this tree is so pretty in flower that fruit would just be a bonus. Enjoy it!